The overall look of the ground has greatly improved with the re-development of both ends. The Bobby Cox & Bob Shankly Stands are similar looking, both being single tiered and roughly of the same height. Both sides are quite old looking stands. The Main (North) Stand is a covered seated stand, unusual in that it is oval in shape, meaning that those sitting on the half way line are furthest away from the playing action. In fact at one time the whole ground was oval. It also has only a small amount of seats in the lower portion of the stand, with the bulk of the seating in the upper part. On the other side is a more conventional single tiered stand, that only runs for about 2/3rds of the length of the pitch. Both these stands have many supporting pillars that may hinder your view. Away fans are housed in the Bob Shankly Stand at one end of the ground, where up to 3,000 supporters can be accommodated. If required then a further 1,000 seats can be allocated in the Main (North) Stand towards the Bob Shankly End. The facilities within the Bob Shankly Stand are quite good and the view of the playing action excellent. The great thing about this stand is that even a relatively small number of away fans can really generate some noise. George Hobb a visiting Hearts supporter adds. 'normally a relaxed and friendly day out and the atmosphere generated within the ground can be quite good'. The Centenary bar near to the ground welcomes both home and away supporters. The bar has two rooms within it, one of which is used for home fans and one for away supporters. George Hobb recommends 'The Clep bar on Clepington Road. Great pies, friendly bar staff and very reasonable prices. It is only five minutes walk from the ground'. Follow the A90 through Dundee. Leave the A90 at the junction with the B960 (sign posted 'Football Traffic'/Dundee), and turn right onto Clepington Road (B960). Continue along Clepington Road for one mile where you will reach a roundabout. Go straight across the roundabout and after a short distance you should be able to see some floodlights over beyond the houses on your right. Take the 2nd right into Arklay Street and then right into Tannadice Steet. Dens Park is up at the end of this street on the left. There is an official car park behind the Bob Shankly Stand which costs �2 per car, otherwise street parking. Dundee train station is over two miles away from the ground and is quite a walk away from the ground (25-30mins). Best to jump in a taxi. Leave the station via the long covered footbridge, take the exit to the right before the walkway enters the Nethergate centre, this exit has steps down to Union Street. Go to the top of Union St & turn right into the High St, after a couple of hundred yards veer left into the pedestrianised Murraygate and proceed to the Wellgate centre. Go via the escalators in the Wellgate centre to the top floor of the centre and exit onto Victoria Road. (If Wellgate is closed, turn left along Panmure Street, right up Meadowside and right onto Victoria Road to rear of Wellgate Shopping Centre). Here you have two choices, via the Hilltown (Shorter distance but like climbing the north face of the Eiger) or via Dens Road (much longer but far less likely to induce a heart attack). Option 1 (for those fit enough) cross Victoria Road to the foot of the Hilltown walk up this for approx 1/3 mile (it feels like 3) till you reach the junction of Main St & Strathmartine Road this is easily recognisable by the ornamental clock near the junction. Turn right onto Main St and proceed until you reach the junction with Isla St (Church on the corner opposite the excellent Snug Bar). Turn left into Isla Street (at Clepington Church). Continue across Dens Road into North Isla Street and turn left at Tannadice, Dens Park is just up the road. Option 2 Turn right onto Victoria Road proceed about 1/4 mile, veer left at the Eagle Mills into Dens Road. Pass Dura Street, Alexander Street and Dens Road Market then right into Arklay Street. 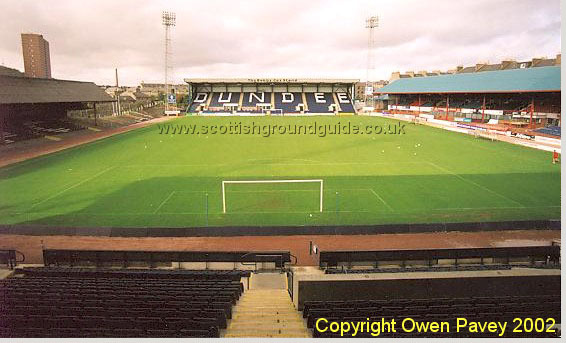 Once you reach Tannadice Street turn left past Tannadice, Dens park is just up the road. Neil Gellatly adds; 'Alternatively frequent bus services are available from Albert Square. Visit www.dundeetravelinfo.com for more information. Thanks to Neil Gellatly for providing the directions. For the Dundee fixture list click here (to take you to the BBC Sports Website). Spaces are available in both the East & West Stands. Wheelchair users are admitted free, whilst helpers are charged �13. Spaces must be booked in advance by calling: 01382 826104. 43,024 v Glasgow Rangers, Scottish Cup, February 1953. One of the most unusual aspects of visiting Dundee is seeing how close the ground is to their rivals United. They are literally a few hundred yards apart on the same road. I believe that these two grounds are the closest together of any in the country. For an aerial photo showing their close proximity click here. If you require hotel accommodation in the area then first try a hotel booking service provided by Football Hotels who are powered by Activehotels, who specialise in locating accommodation near or within a short travelling distance of the football ground. They also have the added advantage over some other hotel booking services that you pay on departure. Yes this site will earn a small commission if you book through them, but it will go to help with the running costs of keeping the Guide going. To access their Dundee page click here.